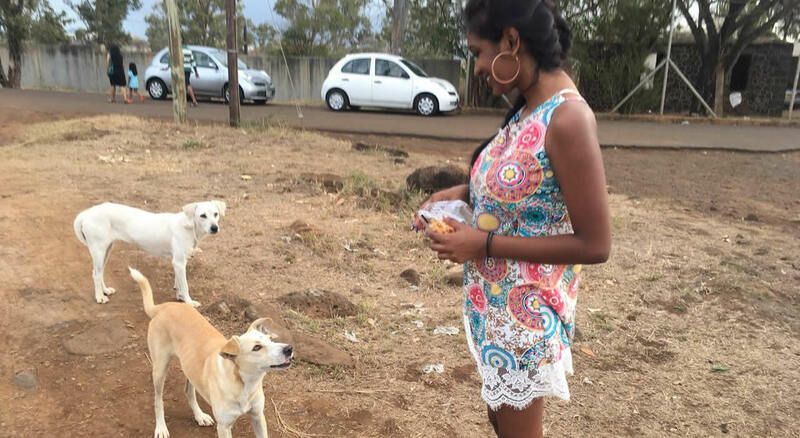 Her love for animals holds no barrier and she is strongly against the ill-treatment of stray dogs. Nandini Harrah, 25, has become the voice of these disadvantaged creatures and she is striving to change mindsets in the country. She shares her affection for animals and her views on the killing of stray dogs with News on Sunday. As the saying goes, a dog is man’s best friend. However, not everyone shares the same outlook. While some people would die for their pets, others view animals as beings that are undeserving and therefore are unworthy of any special treatment. A true animal lover, Nandini Harrah fell in love with the animal world when she was a child. “My first pet when I was a child was a guinea pig named Shadow. It spent 10 years by my side and we shared so much love together. I even brought it to college in my school bag. We had many dogs and cats, which were taken care of by my grandmother. She also had goats and hens.” Nandini, who now works in the Human Resources field, explains that after her guinea pig, she had a tortoise, a hamster and birds. People in my family find it hard to understand how I can love animals more than humans." She says that she does her level best to help as much as she can. “I try to help as many injured and needy animals as I can, even bats. I take them to the veterinarians; try to find a home and a family that would adopt them. However, it is not every time that I get help. I sometimes have to put the dogs in paid kennels. Everything I do is at my own cost.” She highlights that the most difficult thing is to change people’s mindset.